On the 3rd January, the government announced that, “2017 will see the first Starter Homes being built on brownfield sites across the country”. The scheme will make suitable land available to developers by 2020. A recent study by the Campaign to Protect Rural England (CPRE) reports that as many as 1.4 million brownfield sites could be suitable for development across England. Whilst this provides a great opportunity for many first-time buyers across the UK, the challenge for developers is to build quickly with minimal delays. At Met, we regularly speak to developers who have incurred costly delays to their project due to unforeseen factors not identified in the pre-construction planning phase. Brownfield sites are notorious for being difficult to develop because of the problems that historic land-use may leave behind. Two of the costliest issues that brownfield developments face are contamination and the existence of on-site hazards and obstacles. This includes above ground hazards such as old buildings and infrastructure that may need to be recorded for heritage purposes, made safe, or demolished, but often the costliest hazards are those that lurk below the surface. These hidden hazards can quickly lead to rising costs and decreasing profit margins as delays are experienced and unplanned and uncosted mitigation measures need implementing. Hazards on brownfield sites are inevitable, but if they can be identified prior to the construction phase, development becomes a lot more straightforward. Designs can be tailored around obstacles, and measures can be taken to deal with the issues at an early stage, when associated costs are likely to be less. Knowing the risk goes a long way towards mitigating the risk, and allows informed decisions to be made on the viability of developing any particular site. To achieve this kind of informed overview, upfront planning to investigate and understand the profile of a brownfield site is needed. 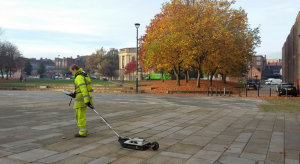 This can be achieved through a mix of environmental assessments, surveying, environmental geophysics and site investigation. Traditional approaches use Phase 1 desktop assessments and intrusive site investigations to determine the risks posed by a site. But, by also carrying out land surveys and geophysics it is possible to gain a more accurate view of the sub-surface, and target the features that need further investigation – filling in the gaps between the randomised trial pit and boreholes used in the intrusive site investigation. In this way it is possible to ensure that any key areas are examined in the initial investigation, rather than being discovered at a later stage or during construction. Keep an eye out for our blogs over the coming weeks, where we’ll take an in depth look at each of the techniques used for surveying and investigating brownfield sites prior to development.